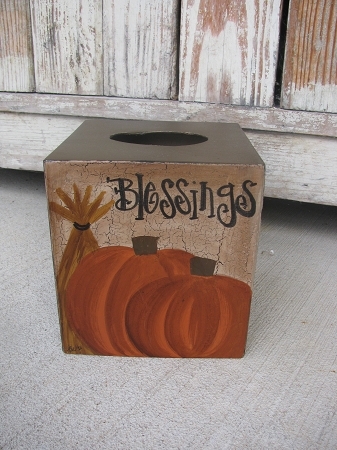 Primitive Blessings Fall Autumn Pumpkin Hand Painted Tissue Box Cover. Perfect design for fall. Featured in Country Sampler Magazine August 2017 Edition. 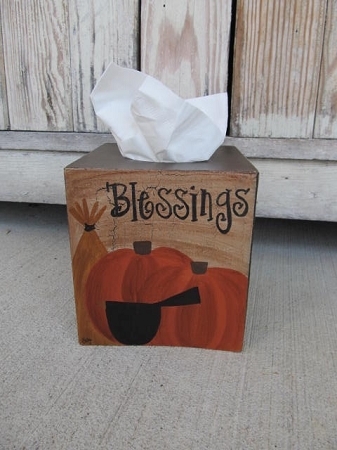 This is a paper mache tissue cover that I hand painted a pair of pumpkins with a wheat bundle behind them and the handwritten saying Blessings. Holds a boutique size tissue box, Size is 5"x5"x 5 1/2". Choice of side/top color, shown in Milk Chocolate Brown. See list of choices. Also a design option to have the crow painted on or not. Please select your choice. Hand painted, designed and signed by Heidi.